Zephyr S is a next-generation, high-altitude, pseudo-satellite being developed by Airbus Defence and Space. Image courtesy of Airbus Defence and Space. The UK MOD placed an order for two Zephyr S solar-powered UAVs in February 2016. Image courtesy of Airbus Defence and Space. Zephyr S is the latest addition to the Zephyr family of unmanned aerial vehicles. Image courtesy of Airbus Defence and Space. The Zephyr S next-generation High-Altitude Pseudo Satellite (HAPS) is a new variant of the Zephyr family of unmanned aerial vehicles (UAVs) owned by Airbus Defence and Space. The aircraft was unveiled at the Farnborough Air Show 2018. Zephyr S, a production variant of Zephyr 8 demonstrator, is designed to offer greater operational flexibility and improved endurance than its predecessor, Zephyr 7. The new variant is intended for a variety of military, security and civil missions, including maritime surveillance, border patrol, intelligence, reconnaissance, navigation, satellite-like communications, missile detection, environmental surveillance, signals intelligence (SIGINT), in-theatre C4ISTAR relay, continuous photo capturing, and humanitarian and disaster relief. Development on the Zephyr 8 HAPS programme began in April 2014. The UK Ministry of Defence awarded a contract to Airbus Defence and Space for the production and operation of two Zephyr S solar-powered unmanned aircraft systems in February 2016. An order for the third UAV was placed in August 2016. The three aircraft are intended to provide battlefield intelligence and surveillance to the UK Armed Forces. The first production examples were built at Airbus Defence and Space’s manufacturing facility in Farnborough, UK. The Zephyr S HAPS serial assembly line in Farnborough, called Kelleher facility, was opened in July 2018. The first production aircraft performed its maiden flight in July 2018 and achieved a flight endurance record of nearly 26 days. The aircraft is set to perform additional flights from the Wyndham airfield in Western Australia during the second half of 2018. Built using carbon fibre composite materials, the Zephyr S unmanned aerial vehicle is 30% lighter than the Zephyr 7 and can be landed, re-equipped with next-generation payloads, and re-deployed. The Zephyr S HAPS has two main wings spanning 25m with upward cranked tips. Its tail section is arranged in a T-configuration to provide aerodynamic stability and flight control. Weighing 62kg, the unmanned aircraft incorporates an array of high-efficiency ELO-based solar cells on the entire wing to generate power. The solar sheets have power density values of 1,000W/kg and aerial powers in excess of 250W/m². The aircraft is capable of flying autonomously from take-off to landing and can be remotely operated from its ground control station. Zephyr S can carry payloads weighing up to 5kg to provide increased surveillance and communication under all weather conditions during the day and night. The UAV uses lightweight, high-definition, optical / infrared video cameras to produce real-time, high-resolution NIIRS 6 imagery and video of the earth under all lighting conditions. An automatic identification system (AIS) is installed to identify, locate and track other objects in the vicinity. The UAV also incorporates narrowband mobile communications network to transmit information at a data rate of 100Mpbs. The Zephyr S HAPS is powered by two solar-powered electric motors. The solar energy is generated by a combination of solar cells and high-power lithium-sulphur batteries. Each motor drives a two-bladed propeller mounted on the wings. The UAV is capable of flying at altitudes of 70,000ft and can stay airborne for one month before landing. It can execute missions in air traffic and jet stream winds. It is suitable for both line-of-sight (LOS) and beyond line-of-sight (BLOS) operations. The BLOS operation is enabled by a satellite communications system of low mass. The UAV can also transmit real-time imagery, voice and data to areas covering 1,000km² over a long distance. Airbus Defence and Space awarded a contract to MicroLink Devices for the manufacture of epitaxial lift-off (ELO)-based, multi-junction solar sheets for installation onto the Zephyr S vehicles in May 2016. 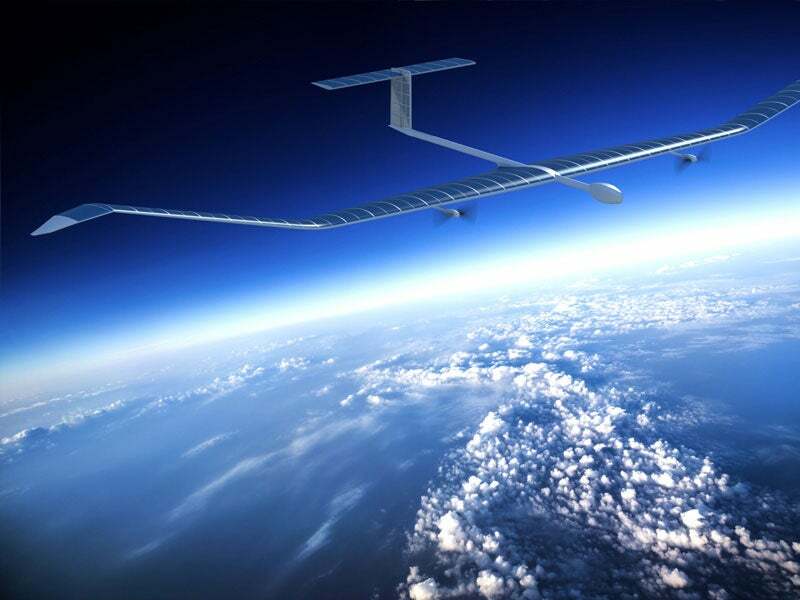 The solar-powered Zephyr unmanned aircraft was originally designed and developed by QinetiQ, but sold to EADS Astrium (now Airbus Defence and Space) in March 2013. The aircraft in the Zephyr family include the Zephyr 7, Zephyr S, and twin-tailed Zephyr T, which is designed to carry larger payloads.